For a change, this week... Books! On the right is a book by Jean Hatzfeld who has written several books about the 1994 genocide in Rwanda. In this book are the stories told by the survivors of the massacres and by the killers. They're now all forced to live together by the "reconciliation" political program. I couldn't put this book down and was frustrated when I finished it. It's not a nice read, of course, but it adresses essential questions about being human, living, forgiving, believing (or not)... What's frustrating is that there is no answer, only more stories, more ways of coping, more questions. On another level, the French spoken by Rwandese people is particularly beautiful, and precise, and I enjoyed that a lot. (not sure how it comes across with the translation). All his books are available at Amazon.com in english. This one is called "the antelope strategy". There are two others about Rwanda, and I intend to read them very soon too. On the left is a book I read a few years ago (but I didn't want a "fun" book beside the Hatzfeld one). It's a young German officer (Ernst Jünger himself) telling his life during the 14-18 war. No answers here either, but it's a powerful, essential book. There's no judgement and no propaganda there, just noise, fear, and people trying to stay human. To keep this post very original... portraits! A young girl from Togo, a boy from Republic Tcheque, and the last one is a girl from Liberia, all copied from photos in the book "Si tous les enfants du monde". The third girl I saw on "Photo of the year.com" and she was called "Cambodian Princess". I'll be at my sister's wedding this weekend (providing the airport is open since it was flooded and closed yesterday...). Will I have the courage to draw out my sketchbook and draw in public? I'll tell you in a few days! 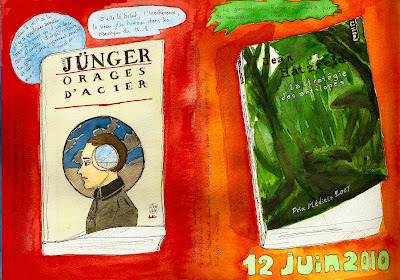 I like the books you drew (love the back ground colour how it pulls it all together and contrast agianst the greens), and the story behind them is good. I would really like to read the one about Rwanda. Very good sketches of the books, I hope you get the courage to sketch in public, it's not easy! I too love how the background color pops out the greens, and ties it all together. Fantastic! Interesting post. Your faces are very nice. Especially the "princess". I find drawing faces in ink very difficult. You did a great job. I'm having a great time seeing these, so don't feel that you are being repetitious! The way I see it, you are "focusing" on this topic right now. These are great. 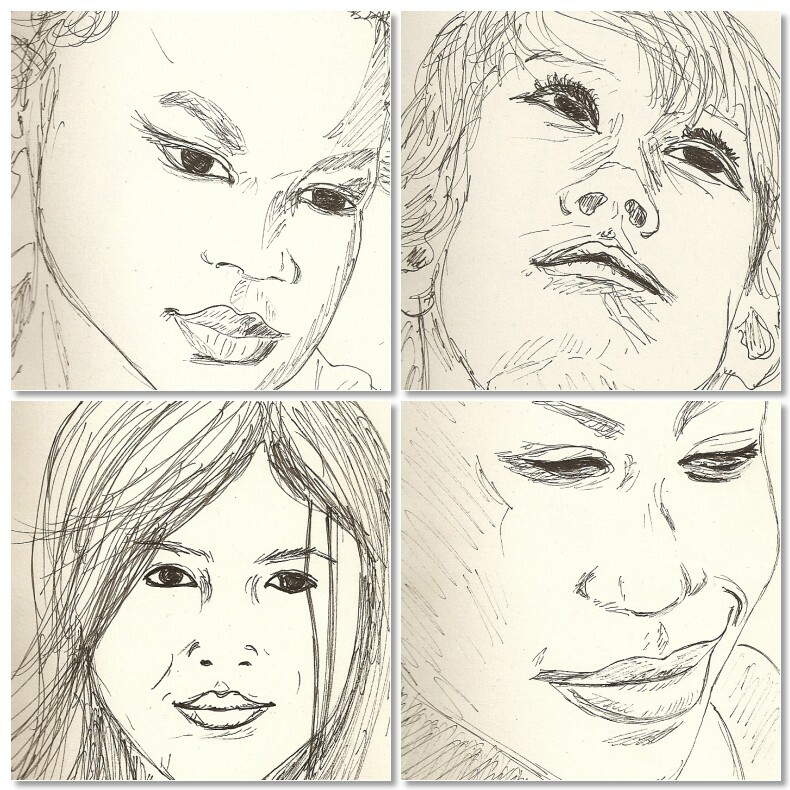 Portraits are difficult and here you are doing them straight in ink! Love the books too! I am always crazy about your boxes of portraits. Wonderful! You book pictures are always a joy to see - and the information you provide about the contents.